The Dreadnought Project :: View topic - Grandfather's memories..
Posted: Sun Dec 14, 2008 2:20 pm Post subject: Grandfather's memories.. I found out about this site from the game "Jutland".. 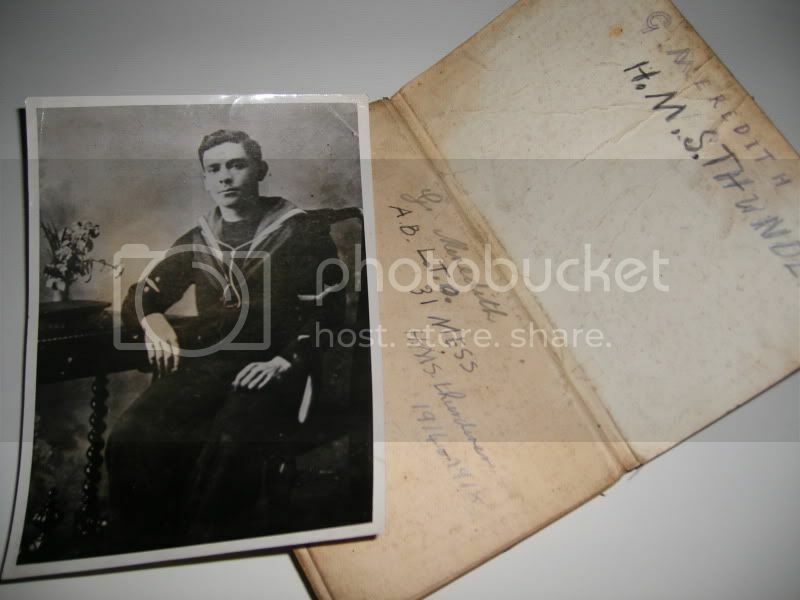 I thought I'd post some memories I have from my Grandfather who was at Jutland on HMS Thunderer. He also served in the landings in the Dardanells and was wounded rowing infantry ashore. His record of service. I recall him telling us he ran away as he was afraid of the mast at HMS Ganges. I saw a video of the mast drill on youtube, and can now understand why! 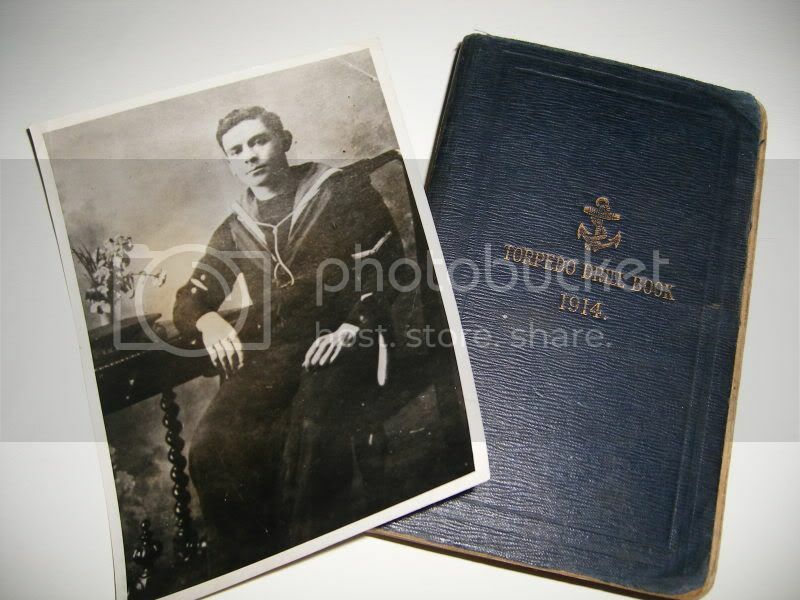 He joined back up in WW1 and was posted to the Grand Fleet. He told us he could remember the crew painting the Thunderer at least 4 times! I have a postcard showing Britania and titled "Jutland" that he sent to my grandmother after the battle. 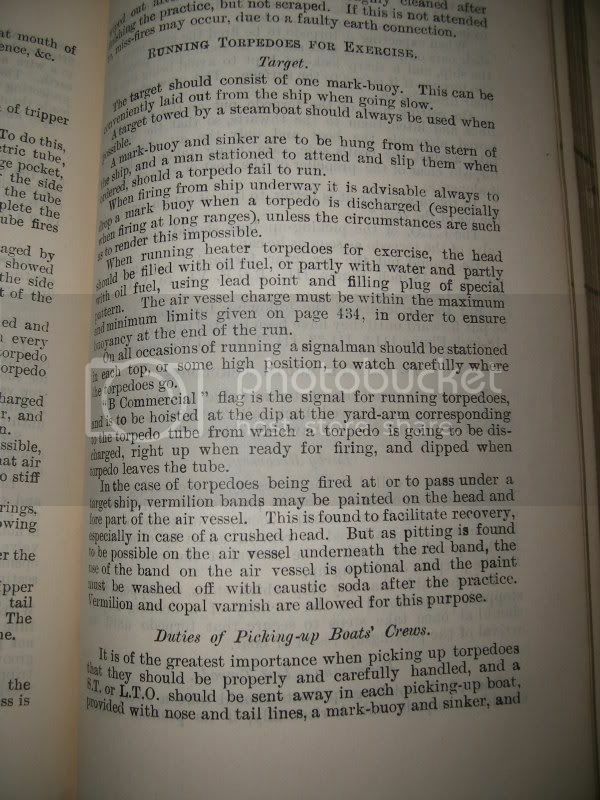 More relevant to this forum though is my most prized possesion is the 1914 Torpedo Drill Book he gave me. Still in great shape, although a little yellow. A Torpedo Drill Book covers all technical operations of ships from Batteries to Fire Control. 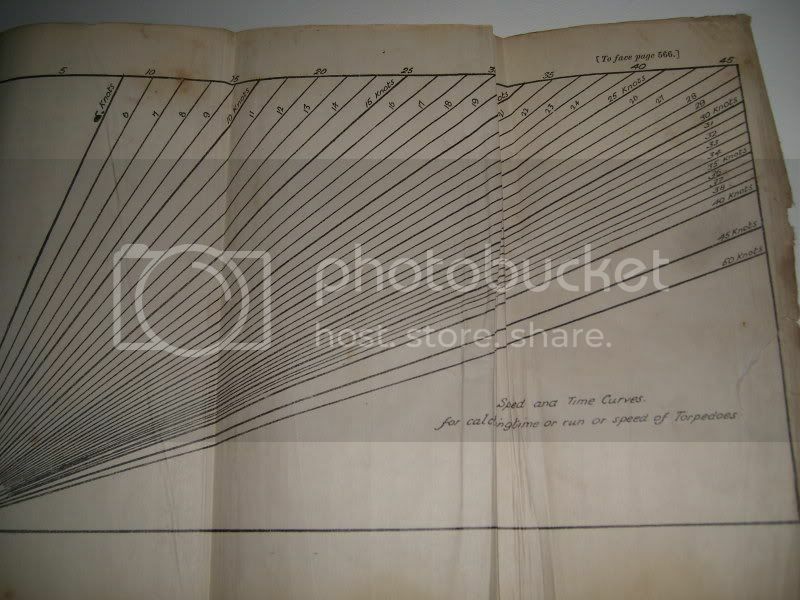 It has charts, diagrams and data for mines, torpedos and guns. I can scan any bits from it that anyone might be intersted in. Grandfather was a A.B. LTO, Able Bodied Leading Torpedo Operator. MadMez -- thanks for piping in. The 1914 Torpedo Drill Book is a classic, and a great illustration of the surprising fact that "torpedo man" meant, in effect, "magician" in the dawn of the electrical era, as they were meant to take on all electrical duties by virtue of their technical prowess established by the study of the wonder weapon, the torpedo. He looks like a bold and promising sailor. 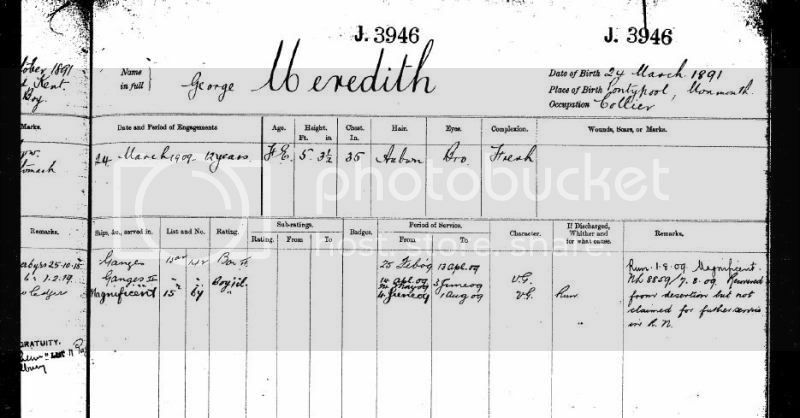 I wonder did he serve down in the torpedo flat during action, or did he perhaps operate a director (often sited in the conning tower or similar)? I will look and see if Thunderer reported firing any torpedoes at Jutland. One thing I'd suggest -- print up a sheet or three on your grandfather on acid-free paper and keep it folded in the manual. I don't think you should ever sell it, but if family tragedies ever lead to its sale or simply to a loss of direct remembrance of his story, these facts will find themselves in the perfect place to continue his story for the longest time possible. Thanks for the tip! I have his service record from the National Archives in the Drill Book. He passed away in 1975, but I've forwarded your comments to my father who might have some memories of his service. I do recall something about the director, but my main memory of him is that he always talked about how often they painted the thing! My father told me my one surviving aunt has a box of letters and memorabilia from Grandfather. He'll see if she can find it. His memory is fading too (he's a WW2 veteran - D-Day RM Commando) but he did e-mail this snippet..
..during Jutland , on H.M.S. Thunderer , was manning a searchlight from the aft funnel , and witnessed I think it was H.M.S. Lion getting blown out of the water . 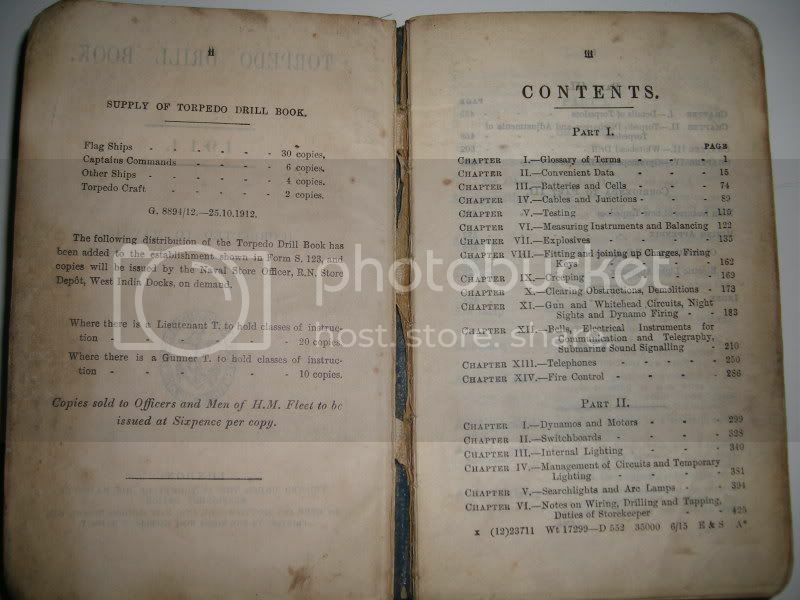 I think more research needed on that in case time has played tricks with my memory..
Let me know if there's anything I can scan from the 1914 Drill Book, and I'll pass on any info Auntie Connie might find. My father and I are both enthralled with your work here. Maginificent! HMS Lion can't be right, as she was not blown out of the water but may have been under ineffective fire at the time she was within sight of Thunderer. More likely, he saw HMS Defence or HMS Invincible destroyed. The Jutland Despatches notes that Thunderer heard and dimly perceived a large explosion just before opening fire, and timing suggests this may have been Invincible. A nonspecific report is made of her observing the Defence and her sisters weighing in and suffering heavy fire. I have a copy of the handbook you have. Posted: Mon Dec 29, 2008 12:01 pm Post subject: Great info, thanks for sharing. Thanks for taking the time to share your Grandfather's story with us. Most interesting material and a fascinating man.